Our District Conference this year will be in Danvers, Massachusetts at Double Tree Hotel. Four other North East (Boston area, Central MA, etc.,) Rotary Districts (7890, 7910, 7930, 7950) will join us at the Double Tree Hotel for their conferences. All five Districts will have a grand gala dinner and entertainment on Friday 3rd, 2019 evening. The CoCo Key Waterpark attached to the Double Tree Hotel gives us an opportunity to make our District Conference one of the most family friendly events ever. Rotarians, bring your children and grandchildren to enjoy the water park. An international service project is planned on Saturday afternoon. "Days for Girls" a non-profit organization that makes and donates sanitary supplies to fill a critical need in South and Central America . The project participation will be three hours. When you register please check the box to participate in this meaningful service project. Also on Saturday there is an option to play golf. As with other conferences, there will be a Rotary International President’s Representative, great speakers, the Four Way Speech Contest and the Youth Exchange Students, and the opportunity to meet old friends and make new ones. Sign up for District Conference HERE or fill this FORM and mail it to District Treasurer Alan Kanegsberg with a check. Discount ends after April 15! Seek Janice H. McElroy Scholarship Applicants! Rotary District 7870 is pleased to announce the availability of a scholarship in memory of Janice H. McElroy, who served as District 7870 Governor during Rotary Year 2011-2012. Governor McElroy was instrumental in securing, after the devastation of Hurricane Irene, a Rotary International grant of $412,000 to help southern Vermont to rebuild. The Janice H. McElroy Memorial Scholarship is made possible due to donations from friends, colleagues, and Rotary Clubs throughout District 7870, covering southern Vermont and southern New Hampshire. Prior to her death in 2014, Jan McElroy requested that any donations received in her memory be dedicated to establishing a scholarship fund for non-traditional students. The recipient must be a person who is 21 years of age or older and has completed high school or earned a GED. There must be at least a three-year gap between graduating from high school and full-time college attendance, or a record of part-time college for three years after graduating from high school. The scholarship funds may be used for expenses at a four-year or a two-year college, or at another type of accredited institution, such as a technical or vocational program. The amount of the scholarship award varies but will be a minimum of $1,000. Click here to download an application form that may be printed, completed, and mailed to arrive before the cutoff date of April 15, 2019. Come and Interact with your fellow Rotary youth clubs in District 7870 (Southern NH and Southern VT)! This is our inaugural Annual Youth Conference that has been planned "By the Youth for the Youth!" It is intended for Earlyact, Interact, Rotaract, Rotex Alumni, and Current and Future Exchange Students. Join us for an innovative and exciting day facilitated by our Youth and Rotary mentors! Engage and learn through group activities and breakout sessions! Exchange ideas and best practices! Learn about the impact Rotary Global grants have on our world! And about how you can get involved! Breakfast and lunch will be provided by the Hopkinton Interact Club. Admission is FREE for Rotary members and Rotaract, Interact, Earlyact, Rotex Alumni/ae, Exchange Students, and for faculty and Rotarian advisers. TEACHERS/ADVISERS: YOU MUST REGISTER YOUR STUDENTS FOR THE CONFERENCE because school regulations do not permit us to send the Evite to student email accounts! It will probably be best to do this during one of your meetings, Your student president, secretary, or other officer can supply each member's email address. CLICK HERE TO REGISTER — BY APRIL 1ST, PLEASE! 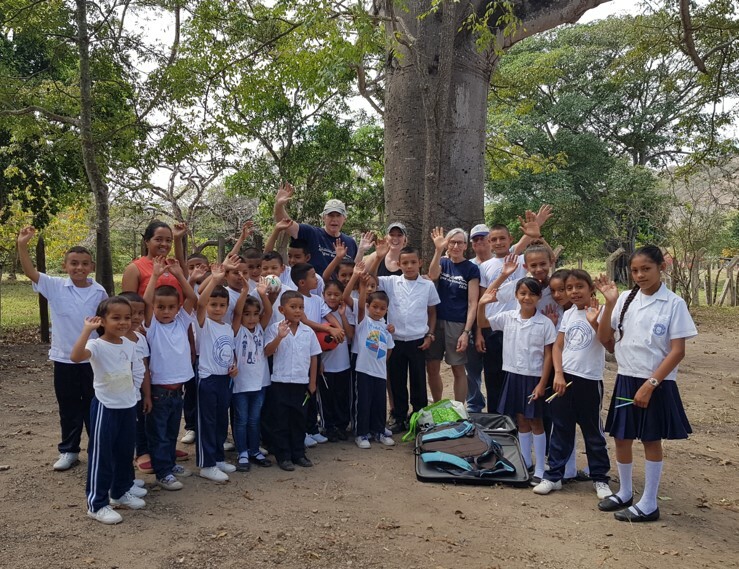 A year ago, the Community Health Center of La Jagua, Honduras, reported many cases of diarrhea, with some cases of children diagnosed with hepatitis. The situation in La Jagua was identified as “critical”, in dire need of safe water and sanitation solutions. Thanks to funding provided by Rotary District 7870 (southern NH & VT) and a group of volunteers from the United States that have become well-known as The Amigos of Honduras, installed a biosand water filter in Escuela Pedro Nufio's classroom and also constructed three latrines, with five taps in the hand-washing station. You can now purchase the new NH ROTARY License Plates from the NH DMV. You will need to purchase a pair of Rotary Wheel License Plate Stickers for application to those DMV License Plates. The price is $19.00 for the two stickers and you must order here (see right-hand column) and either pay by any credit card or by downloading the form and mailing a check as described in the downloadable instructions. The stickers will be sent to you by first class mail. Please verify your mailing address. Was It Rotary Week, or What? Good Job, District 7870 Clubs! 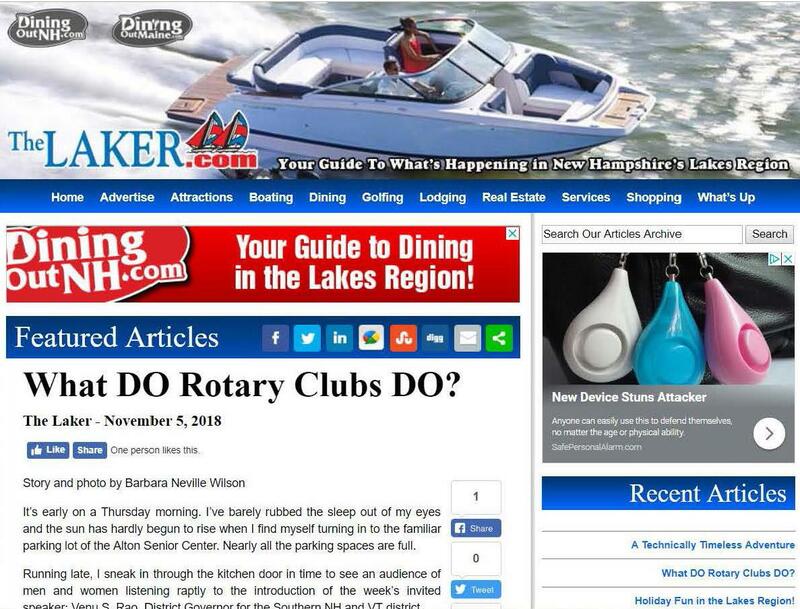 In a major publicity stroke, Rotary in general, and the activities of five New Hampshire "Lake Region" clubs received significant exposure in the area's popular entertainment and event guide, The Laker (photo, above). The well-researched 1,500-word article mentioned the names and the meeting times and locations of the Laconia, Gilford, Meredith, Ossipiee Valley, and Wolfeboro clubs. For each it went on to include short descriptions of the five clubs' projects and service activities. Drawing from not only from locally-gathered facts, the writer, Barbara Neville Wilson, drew not only from these clubs' and the District's web sites, but also from Rotary International. Why shouldn't other District 7870 clubs, or groups of clubs, use this model to gain important PR leverage in their own? 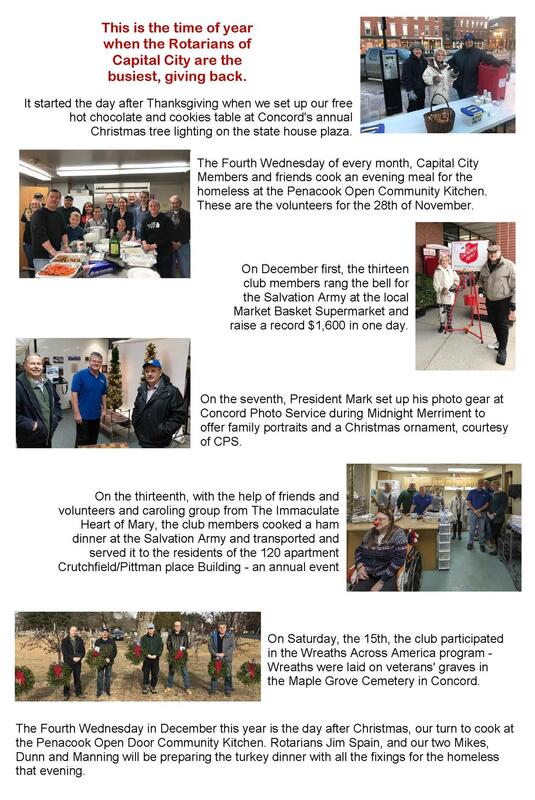 A medium (like The Laker), a writer (who could be a local reporter or a club member) -- add a little time to pull together facts that would interest a Rotary-unaware community, and bingo! A leap forward in our clubs' connection to their communities! Club PR chairs, give it a try! Clubs, District, Join In Donation -- OTHER CLUBS, PLEASE NOTE! Brattleboro Rotary Club, Brattleboro Sunrise Rotary Club, along with Rotary District 7870, donated $1000 to Winston Prouty Center for Child and Family Development’s Early Learning Express. The ELE brings a mobile lending library and literacy enrichment activities to rural and/or low-income areas. The money will be used to buy books, supplies, and fuel. A Rotary wheel is displayed on the back of the bus. PHOTO (l-r): Winston Prouty Center of Child and Family Development executive director Chloe Learey, Brattleboro Rotary Club president Bill Vermouth, Brattleboro Sunrise Rotary Club president Marcy Caulkins, and Sueño LeBlond, Winston Prouty Outreach Specialist. If you would like to purchase a Brick or Paver for the Paul Harris Memorial Garden at the Little Red Schoolhouse, Wallingford, VT.
You can purchase a certificate in a presentation folder for $15.00. Why Donate To The Foundation? The Rotary Foundation transforms your gifts into service projects that change lives both close to home and around the world. During the past 100 years, the Foundation has spent $3 billion on life-changing, sustainable projects. With your help, we can make lives better in your community and around the world. Why should I donate to The Rotary Foundation? Your donation makes a difference to those who need our help most. More than 90 percent of donations go directly to supporting our service projects around the world. How does The Rotary Foundation use donations? Our 35,000 clubs carry out sustainable service projects that support our six causes. With donations like yours, we’ve wiped out 99.9 percent of all polio cases. Your donation also trains future peacemakers, supports clean water, and strengthens local economies. What impact can one donation have? It can save a life. A child can be protected from polio with as little as 60 cents. Our partners make your donation go even further. For every $1 Rotary commits to polio eradication, the Bill & Melinda Gates Foundation has committed $2. What are the areas of the Foundation’s focus? Promoting Peace, Providing Clean Water, Saving Mothers and Children, Supporting Education, Growing Local Economies, and Fighting Disease. Even the United States has problems in all six areas of focus, the reason for Global Grants, assistance going in all directions to help promote a better world. Has your club recently hosted an event or project or are you planning something in the near future that you would like to share with your fellow District 7870 Rotarians? District 7870 depends on the content provided by clubs to publish them on the District Website, District Facebook and District Monthly News Letter, s appropriate. Stories that showcase your club or event should be submitted via prrotary7870@gmail.com. Send photos from the actual event if it has occurred or from a prior year complete with captions describing who is in the photo and the story behind the picture, when appropriate. Including a picture makes your story MUCH more interesting. When writing a story, make the first paragraph as engaging as possible and that will be used on the home page, and the reader will have to click the “Read more” link to get the rest of the story. This will allow for more stories to be displayed on the home page and still allow you to tell your whole story. Three members of District 7870 Youth Exchange committee recently attended a meeting of Eastern States Student Exchange (ESSEX) in Greensboro, NC. ESSEX is consortium comprised of 35 districts from Canada to Georgia and Bermuda that facilitates the exchange program and process for member districts. The semi-annual meetings are an opportunity for attendees to learn about and discuss ideas, changes and advances in the exchange process. The group heard from two university admission officers about the value of youth exchange for college acceptance, learning information that could be helpful in promoting the program in high schools. Members also shared information from the 2-day Youth Exchange Pre-convention held in Toronto last June. A highlight of the meeting was speaker Linda Low, a peace scholar attending the Rotary Peace Center at Duke University. “Travel is one of the best ways to learn important life lessons of empathy and understanding,” according to Low, and is what makes youth exchange so valuable in creating peace in the world. Over visitors have viewed our website.